This is one of my favorite times of year. 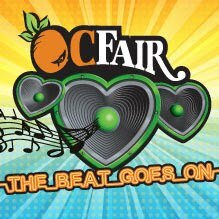 Not because the days are longer or because the weather is typically perfect but because the Orange County Fair is in town. Every year about a million people flock to the fair to partake in all kinds of activities. Tackle the carnival rides, check out the latest newborn piglets, take in the many exhibits that feature things like photography, art, FOOD. Not to mention shop for the latest home gadget or shower replacement. But mostly importantly people look forward to eating. This year the OC Fair did not disappoint. There was a ton of food to choose from. One of the biggest hits this year was fried butter! Check out the review on the Food Frenzy blog from the Orange County Register. I did try some other deep-fried treats and some BBQ. As always some was good, some was okay and some you dream about at night. To start off we have Zucchini Nachos! Is there a better way to eat your zucchini? This would normally have bacon on top but my wife Kim doesn’t eat pork or beef so we opted to leave it off. The nachos did not need the bacon to be good, the gooey cheese had a touch of spice and the zucchini was nice and crispy. These nachos are now officially on my favorite fair food list! We will be looking for these next year. Really a White Castle in there! Ever have a White Castle Burger? How about a deep-fried White Castle? Now I can say yes to both! Yes this is a really White Castle burger battered and fried. Once you get past the breading you can taste the burger. One person mentioned that these are best with some hot sauce. If I get it again I will definitely have to try that. One thing you will notice about the fair this year is there are a ton of barbeque stands. They almost look like chain restaurants and I believe some are. I had to try a few of these and see if any of it was worth the money and stomach space. I ordered a BBQ Tri-tip from American Cowboy Grill. The tri-tip seemed a little mushy. I think it was actually tender but there was so much bbq sauce on it that it was just saturated. Overall I would not get this again. All you could taste was sauce and the roll. I ordered a Giant Western Sausage from Juicy’s. These guys are everywhere. However up near the front of the fair they have a giant bbq grill going on the trailer of a big rig. The rig really catches your eye. Because of that I had to get something and the sausage looked really good. This thing was huge, over a foot long and covered with grilled peppers and onions. I strongly suggest you share this. It could almost feed a family of 4, well maybe it is not quite that big, unless you are on a foodie tour like we were. The sausage itself was good. This is the perfect item if you are looking for something safe. Next on the barbeque list was the North Carolina Pulled Pork Sandwich from Lindsay Concessions. This sandwich had a generous helping of pulled pork and to my surprise no sauce on top. Here you can put on your own sauce. After my earlier tri-tip I opted to go sauce free. I was not disappointed at all; the pulled pork could stand on it’s own, it was super tender and had a ton of flavor. It was on a toasted bun, that was a nice touch. This is a sandwich that is worth getting. Very well done! Now onto Pink’s Hollywood! I ordered a “Rosie O’Donnell Long Island Dog”. The Rosie O’Donnell has mustard, onions, chili and sauerkraut. This is my first Pink’s hotdog and after this experience I am very much looking forward to checking out one of their permanent restaurants. If you want a hotdog with a ton of flavor then Pink’s is the perfect stop for you. Red Velvet and Key Lime C-Cakes! If that was not enough, Kim got us a couple of mini cupcakes from CB’s Cup Cakes. Here you pick what cake you want, then the frosting and lastly the topping. Then you can watch them put your c-cakes together. First Kim ordered a red velvet cake with cream cheese frosting. The second was Key Lime cake with cream cheese frosting and topped with graham cracker crumbs. We both really liked the mini size. After all the other food samplings we were not overwhelmed and got to try two versus only one. Both c-cakes were very good. The cake was moist and the frosting was not too sweet. Dang that was a lot of food! We had a great time; we got to see animals, the photo contest, food art and so much more. If you have not gone to the fair yet this year make sure you do. Great time to start your own foodie adventure! Also don’t forget to share with us what you liked and did not like in the comments section. D-lish! I want to try some zuccini nachos! Yes you should!! If you like gooey cheese these are for you! You are an animal, look at all this grub! That giant western sausage is insane. And I really like the juxtaposition of multiple pork dishes followed by the snapshot of cute baby pigs. I have not clue what you are talking about! LOL I was wondering if anyone would catch that! Nice work Jeff!